A couple of months ago I came across a pair of placemats at a thrift store. They were a woven fiber, I’m thinking banana bark. The colors and textures of the fibers were exactly what I wanted for my HBS Creating Contest floors. Since I forgot to get a picture of the placemats, here is a picture of a banana bark mat that is very similar to the placemats I bought. After cutting apart the placemats I noticed that the strips of banana bark were very wavy from being woven together. I needed to figure out how to get them to lay flat. Nobody likes a wavy floor. My first idea was to soak them, press them between a towel and something heavy, and wait for them to dry. While the banana fibers were soaking I finally glued the framework of my structure together. The inside will be visible through the front and the left sides. The right side and back will be completely blocked off, or at least that’s the plan for now. The idea of waiting for the banana bark to dry pushed me to plan B…the “craft” iron. 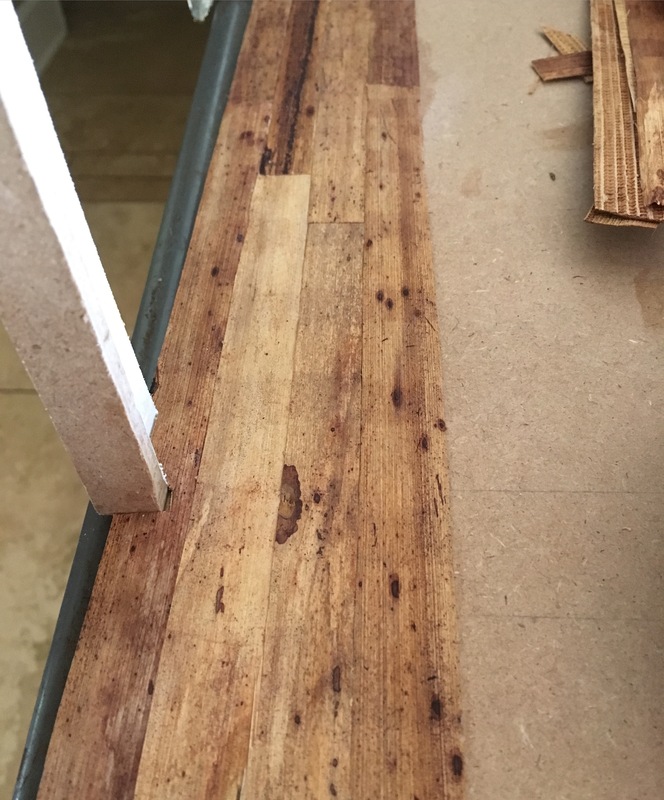 Each strip got dried off, ironed until it was dry, and placed under a heavy board to keep them flat. I suspected that they weren’t completely dry, so plan C…I layed them out in the driveway to use the power of the Florida sun to dry them. That seemed to work, until I realized that they had curled on the edges. Thankfully, running them under the iron one more time seems to have flattened them out for good. Laying the floor is slow going. The strips aren’t the same width and some of them are curved. It will all work out in the end. I’m really loving the variations in the banana bark, creating a nice aged wood plank effect. If I have any of the fibers left (even if I don’t I can always order sheets of it on the Internet), I plan on wrapping some around wooden dowels to create logs for support beams. I’ll need to plot out how big I want the base for the whole build to be. Initially I was hoping that I could keep the overall footprint smaller than the flower shop, but I’m thinking it will end up being about the same. I love the variations in the bark. It looks nicely aged. I just found your blog, have been reading backwards from the current post. I am in love with this project!